Sika Deer represent another popular exotic deer hunted at High Adventure Ranch. Known for their unique sounds that range from a whistle to a high-pitched scream, they actually are fairly close in resemblance to the Elk except smaller. The Sika’s possess a unique horn growth that goes straight up making these a very unique trophy for the deer hunter. The meat of the Sika can be pretty flavorful. 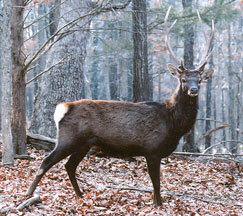 High Adventure Ranch maintains a large herd of Sika Deer for hunting with any type of weapon. Management Sika Bucks and Doe hunts available on a first come, first serve basis from September 1st thru December 31st. These hunts make for some of our most challenging hunts while providing excellent table fare at very affordable prices. They make excellent youth hunts as well. Must book now as availabilities are limited for these hunts. For more information on our Sika Deer Hunting at High Adventure Ranch, please call (314) 209-9800 or fill out our contact form.